Water is an essential for human survival. For sure, you are all aware of how important it is to drink water to keep the body hydrated. Nonetheless, there are some of you who would agree with me when I say that water is boring. Flavored juices and carbonated drinks, on the other hand, can be unhealthy. This is where the drinks from Bai enters the picture. Bai is far from your usual beverage. It is a company that is producing water with distinct flavors. These flavors, meanwhile, are not just for the purpose of making the drink taste better. They can also deliver a variety of health benefits. The best thing is that their flavored waters do not have high calories. 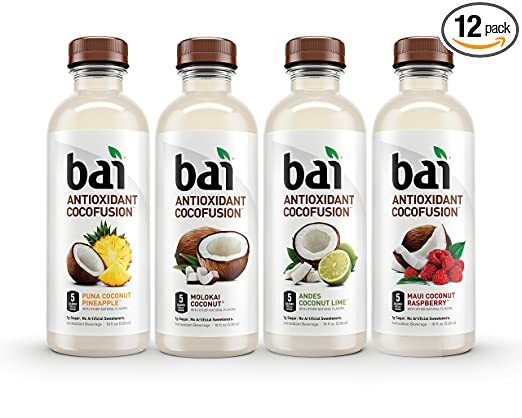 In the rest of this Bai drink review, we will take a quick look at some of the company’s best products, as well as the things that make these beverages a cut above many others that you can find in the market. We’ll also give you a quick introduction about the company and how it is changing the global marketplace. 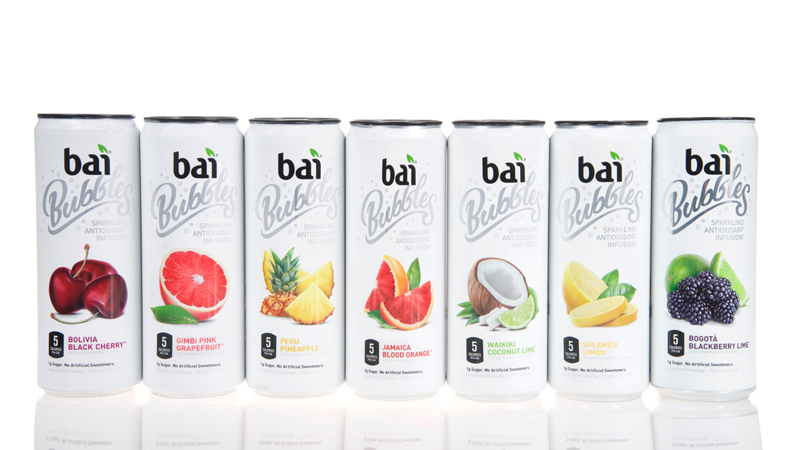 Bai is a company that is popular for their flavored beverages. They envision to create a world that is full of flavor and packed with goodness, which is exactly why they have a diverse range of drinks with flavors that are suitable for people with different preferences. They are committed towards pursuing “bevolution” or a concept of beverage evolution. The company also claims that they do not work for anybody. Rather, they work for your body. This is a bold statement that outlines their goal of making sure that the customers are the priority of the company. Hence, you can expect nothing less from Bai. ​If you are not yet convinced that Bai is a good brand, one thing that might change your mind is the fact that Justin Timberlake recently invested in the company. He is not only an endorser of the brand, but he also has a hand in product development and marketing campaigns of Bai. He has been a long-term user and believer of the brand. Low-Calorie Drink:If you are following a strict diet, this beverage will be a good complement for your lifestyle because of its minimal calories. This is unlike in the case of popular energy drinks and soda that are loaded with sugar that can put your health at risk, especially with obesity. 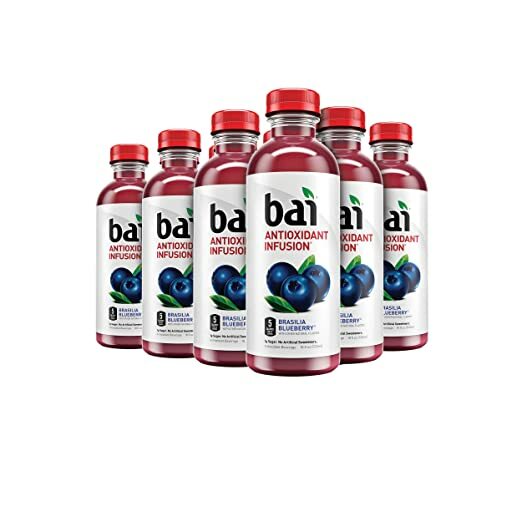 Low Sugar Content:If you are diabetic or if you would simply want to cut down on your sugar intake, Bai beverages will also prove to be excellent. In fact, each serving contains only one gram of sugar. Despite this, you can be sure that the beverages will be tasty. Dairy and Gluten-Free: This is one more reason why this can be the ideal beverage for anyone who is under a strict diet. It does not contain dairy and gluten, which is also exactly why this is perfect if you often suffer from lactose intolerance. Flavorful: In case you have not yet tasted Bai drinks, this is one thing that you might find difficult to understand. Nonetheless, almost all of their drinks are tasty, changing the way you drink water. They have pronounced flavors even if they do not have artificial sweeteners. Halal and Kosher-free:When a product is certified Halal, it means that it passed Islamic dietary standards in accordance to the beliefs and requirements of their religion. On the other hand, a Kosher-free drink means that the product passes the Jewish laws. 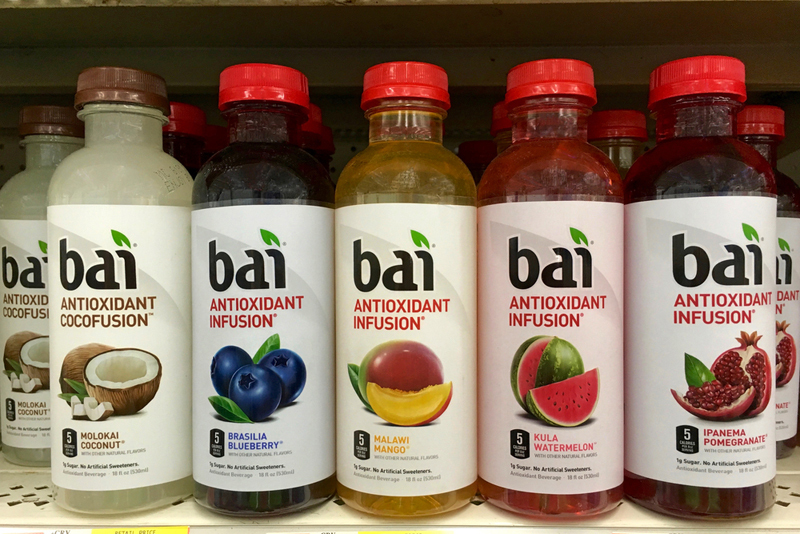 Variety of Flavors:Another good thing about Bai is that they offer a diverse selection of flavored beverages. You will never end up being bored. There is always something new to try. I suggest that you go with the variety packs so that you will be able to try different drinks. 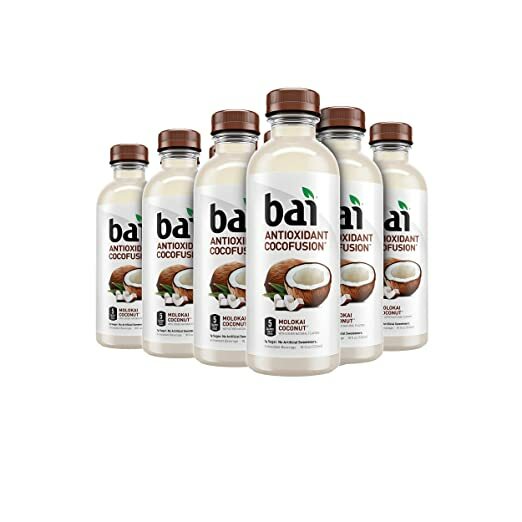 Earlier, we have quickly stipulated some of the best reasons to drink Bai. Here, we will have a deeper look at some of the things that make it different from other drinks. This is perhaps one of the many things that give Bai an edge above many others in the competitive landscape. It stops damages that are caused by free radicals, making it possible to maintain cellular health. The anti-oxidant infusions make the drink not only refreshing, but packed with health benefits. While there are many ingredients that are used in the production of a single Bai drink, one of the most notable is the coffee fruit, which is the super fruit that makes Bai beverages a cut above all others. It is the red pulp that covers the coffee beans. It is high in anti-oxidants. 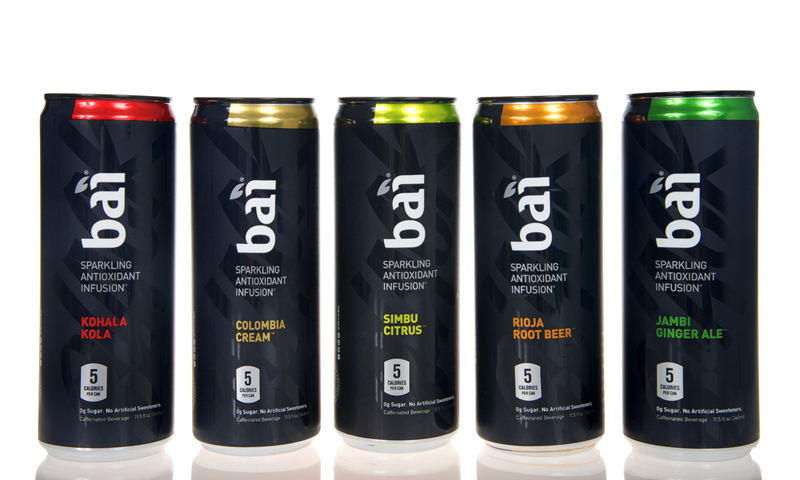 Each Bai beverage contains 35 milligrams of caffeine, which is the reason why this will make a great alternative for a conventional energy drink. It is an excellent way to enhance athletic performance. It can provide the energy that you need during your low days. Rather than using artificial sugar and additives that will improve the taste of Bai beverages, the company makes use of healthier and natural alternatives – stevia and erythritol. Erythritol is a natural sugar alcohol that contains only .24 calories in one gram. Stevia, on the other hand, is a sugar substitute that is extracted from a plant extract. If you have no idea on which one will make a great choice, below are five of the products that are worth considering. 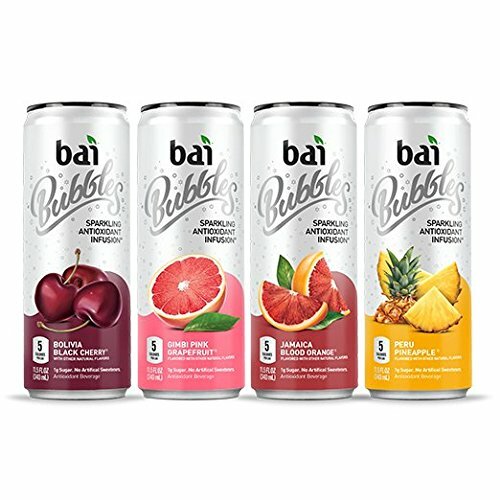 Among others, one thing that we loved the most about this option is the fact that it has an assortment of flavor, which will allow you to try different Bai drinks in one order. It contains Peru Pineapple, Bolivia Black Cherry, Gimbi Pink Grapefruit, and Jamaica Black Orange. If you are concerned on your health, you have another good reason to choose Bai drink. Each drink in this variety pack contains only five calories and one gram of sugar. You can drink more than one without feeling guilty about your health. Another thing that makes this a healthy drink is the fact that there are no artificial sweeteners that are used. The flavor is rich and pronounced, but there is no artificial sugar. With all-natural flavorings, it makes a healthy choice for a flavored beverage. Lastly, like the other drinks from Bai, it has antioxidant infusion, the benefits of which have been tackled in the earlier part of this guide. If you are on the lookout for a low-calorie drink with a flavor that your taste buds would thank you for, this is one that should be on the top of your list. It is not only delicious, but it is also packed with health benefits because the drinks are infused with antioxidants. Aside from having only five calories per serving, it is also worth noting that it makes use of smart sweeteners that are good for your health. It is made using Stevia and Erythritol, which add flavor to the drink without any health risk. Variety is one more thing that we love about this pack. It has 12 bottles, three of each flavor. Molokai coconut is a refreshing tropical-inspired drink. Andes Coconut Lime, on the other hand, has a citrusy note that complements the coconut flavor. Maui Coconut Raspberry, meanwhile, will make you feel like you are in Hawaii. Lastly, Puna Coconut Pineapple has flavors that will take you to the beach. Tropical paradise in a bottle – this is one thing that you can expect in this drink from Bai. It has a refreshing coconut flavor that will make you feel like being in a hammock with palm trees swaying in the background. 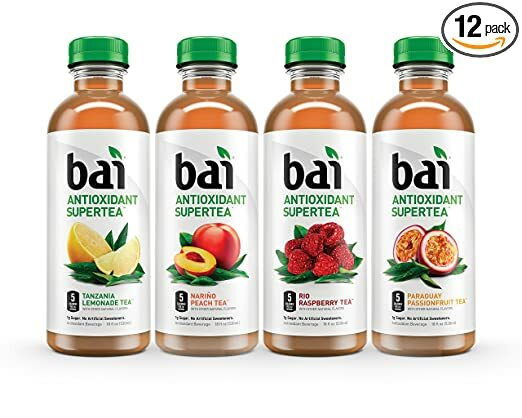 Similar to other products from Bai, it makes use of natural sweeteners that have been developed exclusively by the manufacturer to create a flavorful beverage that does not contain artificial sugar. As an alternative, they use erythritol and stevia. Trying to lose weight? You have another good reason to be an instant fan of this drink. With only five calories in a single serving, you can drink as much as you want without the guilt. Lastly, it also contains tea, which is the main source of caffeine. This means that drinking this beverage will not only be refreshing, but will also provide you with the energy that you need to get through the day. With four flavors that are available, there is surely one that you will love. There is Narino Peach Tea, Tanzania Lemonade Tea, Rio Raspberry Tea, and Paraguay Passionfruit Tea. All flavors are made without artificial sweeteners, using only natural flavorings that ensure a healthy and tasty beverage. If you are concerned about your health, there is no reason for you to be worried. Aside from having only 5 calories per serving, it is also non-GMO and gluten-free. Too add, you might also like how it has low glycemic index. Lastly, it is also worth emphasizing that this is a genuinely brewed tea, which is why the flavors are as natural as possible. It contains caffeine, which is a good component of the drink as it can instantly perk you up when you are feeling down. Exotic flavor – this is one thing that you will love the most about this drink. It is made using blueberries from Brazil, resulting to a distinct and romantic taste. The flavor is even made better by the fact that the drink does not contain artificial sweeteners, similar to those that have been mentioned above. To add, this is a good beverage of choice because it contains coffee fruit as one of its main ingredients. The latter is the one that infuses caffeine in the drink, making it able to provide you with more energy. This makes it a great alternative to the conventional energy drinks, especially considering the fact that each serving contains only one gram of sugar. Lastly, the drink is also infused with antioxidants, which is one thing that separates Bai from all others. It is not just your usual flavored water. The antioxidants are the ones that are responsible for many of its benefits, including the prevention of damages caused by free radicals. After reading this Bai drink review, I hope that you can now make the right decision. If you will ask for my suggestions, I would say that Bai Brasilia Blueberry is the best choice. It has an exotic and fruity flavor that is sure to be refreshing, making it a great alternative to water, soda, and energy drinks, among other unhealthy beverages.